Glaucoma is often called the "sneak thief of sight" because, in its most common form, it progresses slowly and painlessly before victims realize that they have lost their sight. It is a serious eye disease that usually strikes adults 40 years and older.Glaucoma is a degeneration of the optic nerve, usually caused by a build-up of pressure inside the eye. This excessive pressure prevents retinal cells and optic nerve fibers from getting the proper blood flow, which causes them to degenerate. Normal pressure ranges are from 14-22. Patients can have elevated eye pressure (ocular hypertension) and never develop glaucoma. Conversely, although it is not fully understood, patients with normal eye pressure can develop glaucoma. This is called normal tension glaucoma. Both types left untreated may lead to severe, irreversible vision loss. and one develops tunnel vision. Glaucoma is called the "silent thief of sight"
The loss of sight starts at the sides and continues toward the center until a small field or “tunnel” of vision remains. People with normal vision can stand at a street intersection and see traffic from both directions. Those with advanced glaucoma can see only straight ahead as if they were looking through a long tube. Eventually, all vision may be lost. Sight lost to glaucoma cannot be restored, but glaucoma can usually be controlled if it is detected in time. 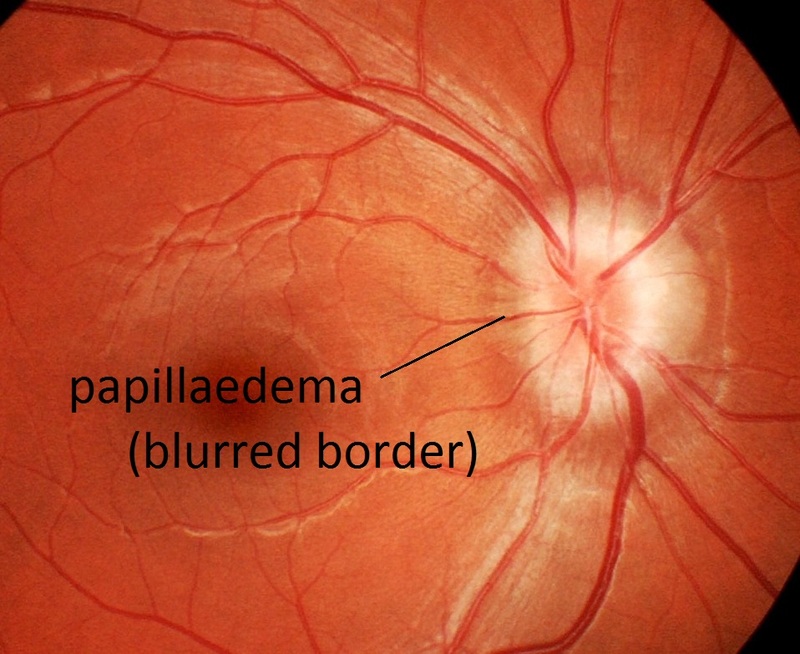 Glaucoma is the leading cause of preventable blindness in the U.S. This year, approximately 67 million people worldwide will suffer from glaucoma. Yet, approximately 2 million Americans don't even know that they have the disease. Others will be diagnosed only when it's too late to save vision. it should be emphasized that glaucoma is not an infection. It is not cancer. It is not a drying up of the tear ducts. It is not caused by overuse of the eyes. It is not caused by too much reading or too much television. It is, however, a serious disease and one that deserves prompt medical attention. Glaucoma is not contagious, but it does run in families. Higher risk factors include having a sibling with glaucoma, injuring the eye, being severely nearsighted, having various other eye diseases, and taking medications associated with increased incidence of glaucoma.Glaucoma can be treated and controlled if detected early. Detection of glaucoma requires periodic eye exams with ancillary testing. It is especially important for people over 40 and/or those with any of the higher risk factors explained above. Although there are many different varieties of glaucoma, the most common are chronic, primary open angle, normal tension glaucoma, and acute closed-angle glaucoma. It is by far the most common. It is painless. It slowly destroys vision without warning. By the time a vision problem is noticeable, irreversible damage may have occurred. Chronic glaucoma can be detected through a routine eye exam. Because it is silent and strikes adults, it is important for people over 40 to have a periodic eye exam. 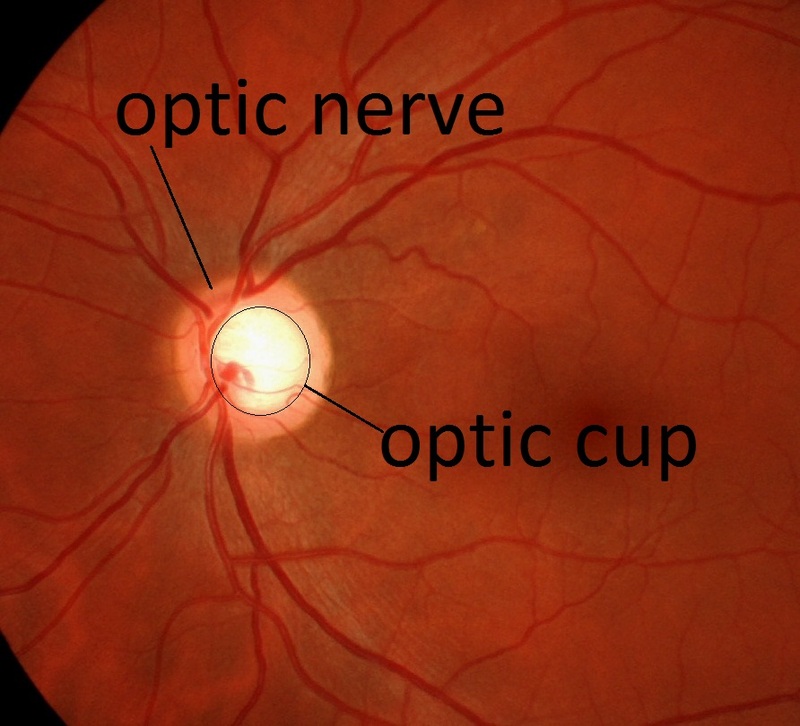 Normal size optic nerve cup. 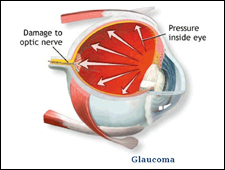 glaucoma from elevated eye pressure. Although it is not fully understood, normal tension glaucoma can occur in patients with normal eye pressure. 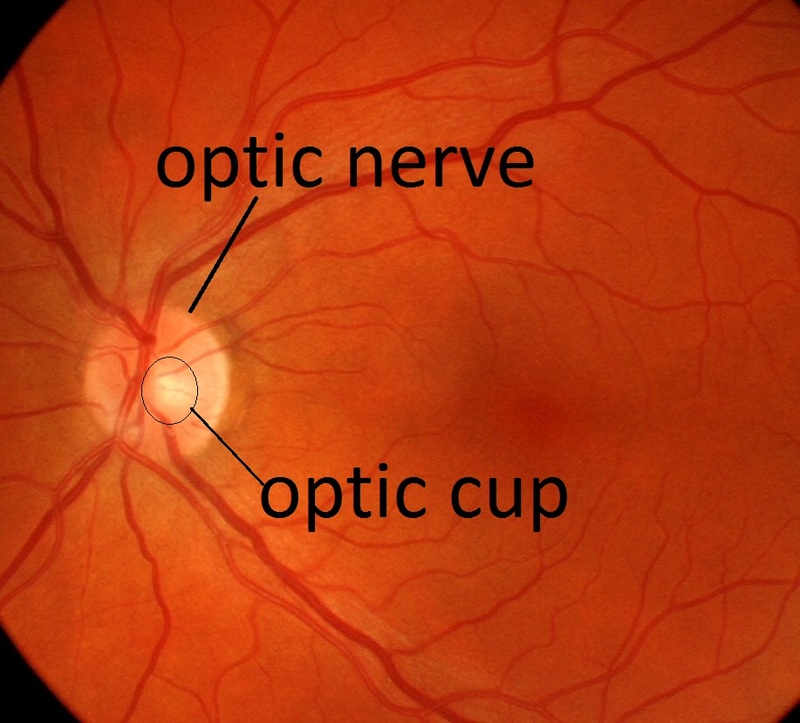 It is believed that the optic nerve is deprived of nutrients in the blood, causing its degeneration. Eye pressure is just one bit of data needed to diagnose this disease. Often more than just the "puff of air" test is needed to determine if a patient has glaucoma. It is believed to be associated with low blood pressure, and people who suffer from sleep apnea are at greater risk. Chronic Narrow-angle glaucoma is a condition where the eye drainage ducts cannot adequately filter the eye fluid (aqueous humor), causing a build-up of pressure. 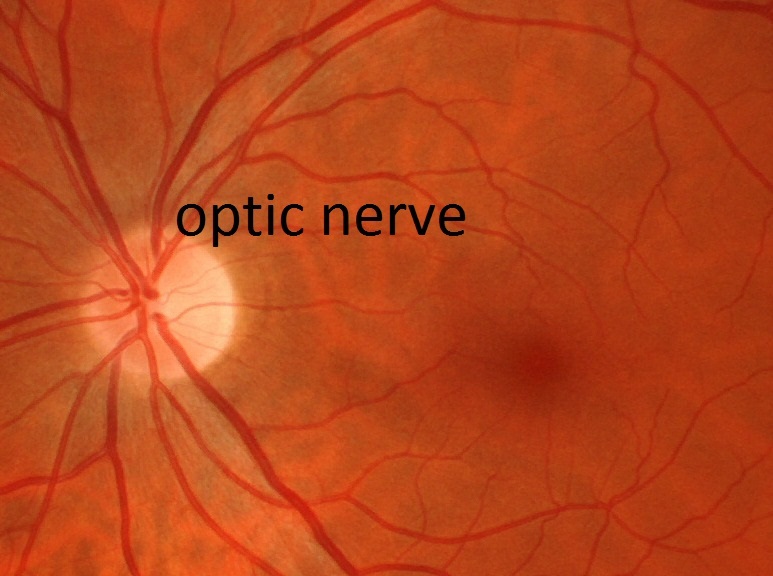 Over a period of time, this increased pressure can permanently damage the optic nerve. Those with chronic narrow angles are more predisposed to a devastating Acute Closed-Angle attack. Those with narrow angles need to be cautious with certain medications as they can precipitate a glaucoma attack. Permanent preventable treatment is performed by a five-minute-office laser procedure called a PERIPHERAL IRIDOTOMY (above) that will make it impossible for the drainage ducts (angle) to be closed or blocked. To elaborate on Acute closed-angle glaucoma, it is not very common, but it can be devastating.It is caused when the eye's drainage ducts become blocked from the pupil dilating. It is marked by a sudden, severe pain in and around the eye, headache decreased, foggy vision, halos around lights, nausea, and vomiting.The eye pressure is extremely high (50-60), which can lead to vision loss as little as24 hours. To alleviate this pressure, immediate, emergency treatment is required. 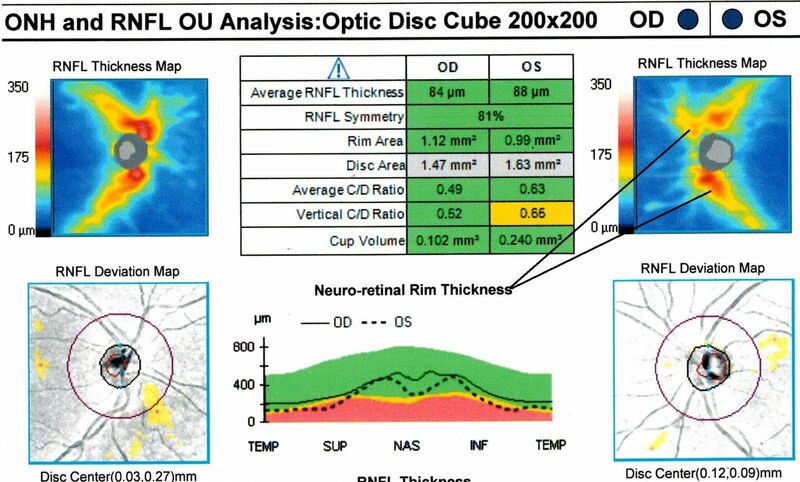 Because many of the standard tests are inconclusive for glaucoma, we have invested in all the technologies above to give us as much data as possible to accurately assess the health of your eye.The most recent technology, the Cirrus 5000OCT essentially does a laser ultrasound underneath the surface of the retinal to determine the thickness of the optic nerve cells. 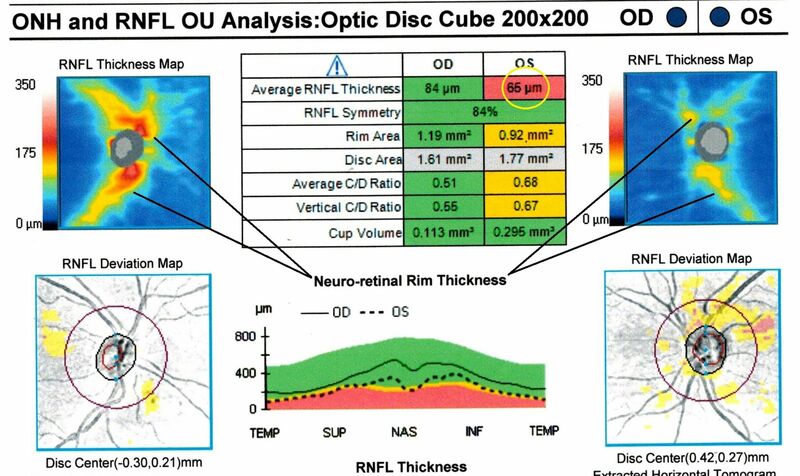 In fact, this instrument can detect damage in the Optic nerve as much as 5 years prior to previous testing methods.This test is simple, quick, and painless. Nothing ever touches the eye! This has been a significant breakthrough compared to existing tests. 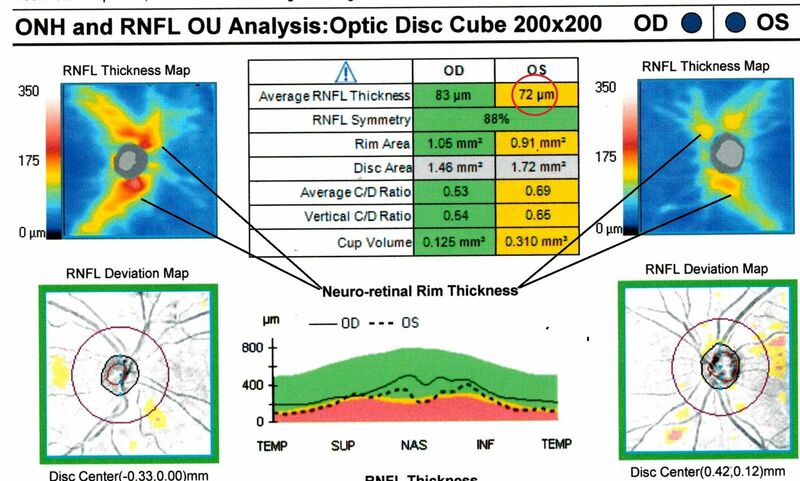 The standard eye pressure check (tonometry or "puff of air") is often inconclusive for detecting glaucoma in many patients.Noticeable peripheral vision loss doesn't show up until after millions of nerve fiber cells have been damaged by glaucoma. Printout of healthy eyes without glaucoma. 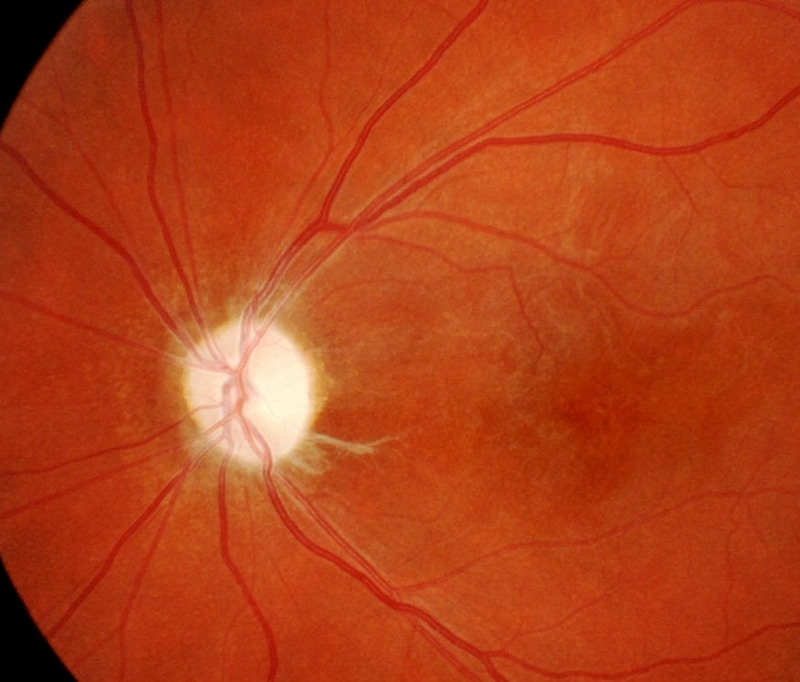 Below from left to right: The eye developing damage from glaucoma. The OCT takes thousands of scans a second measuring the thickness of the nerve layer BENEATH the surface of which can not be seen by the doctor. The colors in the blue box on the left remain stable while there is a loss of red and yellow in the blue box on the right, indicating damage to the underlying nerve layer. This technology can detect changes years before conventional methods.Glaucoma can usually be controlled with eye drops.Damage from glaucoma is permanent, so it is imperative for vision preservation, that it be detected and treated early. 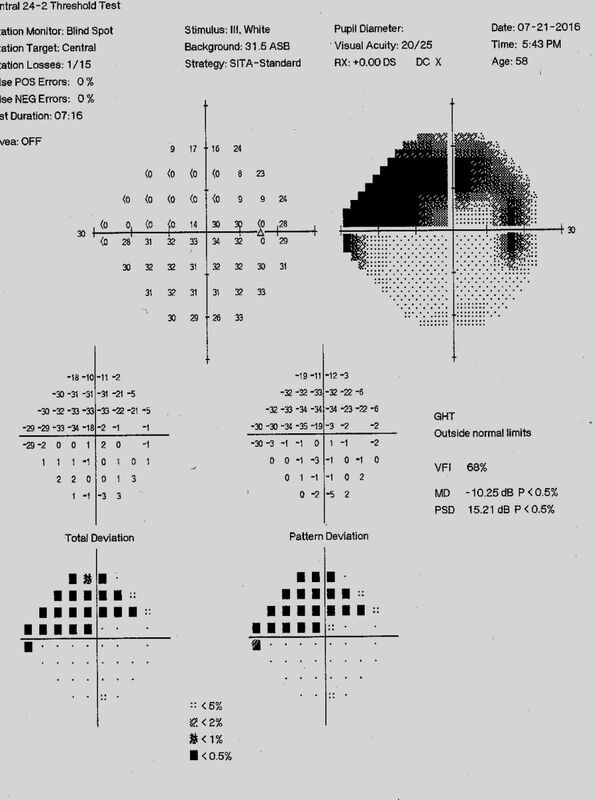 The Zeiss Humphrey Visual field testing (perimetry)is still the standard method of following glaucoma and will tell us if the eye is being damaged from glaucoma before it becomes noticeable to the patient. 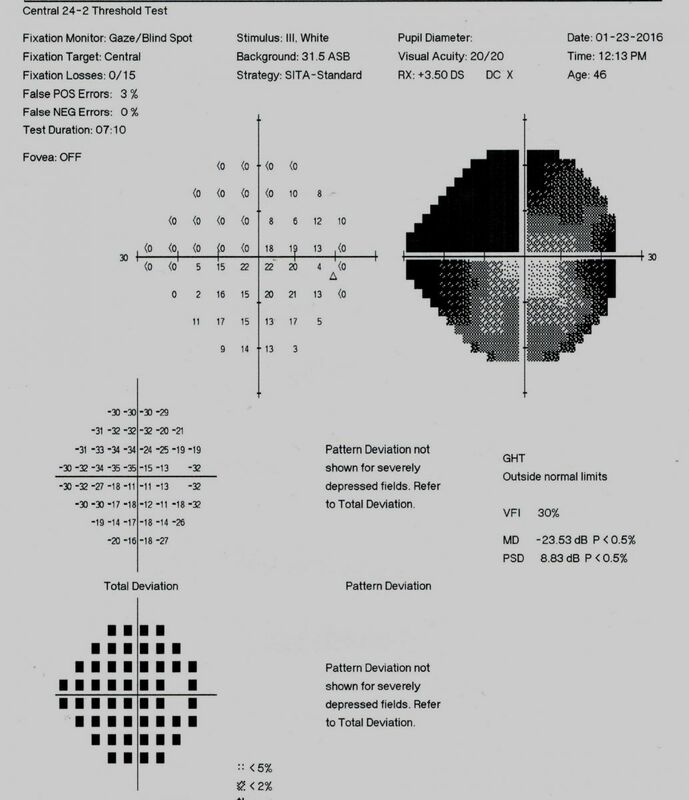 This is the test that presents a series of lights in your peripheral vision and maps out the consistently dimmest light the patient can see at over multiple points in the field of vision, so it can be accurately compared from test to test. Genoveva entering data for a visual field test. 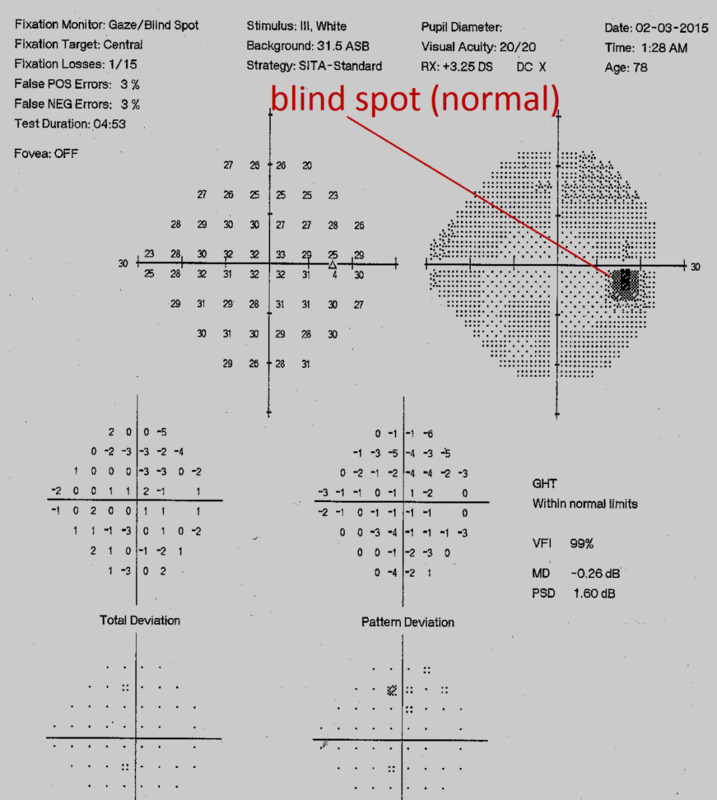 A normal visual field printout. At Skowron Eye Care, we have raised the standard of care for glaucoma by performing OCT, Pachymetry, Gonioscopy, Retinal Photography and Optosin addition to perimetry (Visual field testing). This enables us to very accurately assess any progression of glaucoma and, in turn, recommend early, proper treatment to prevent vision loss. While glaucoma can occur without warning, any one of the following symptoms is possible and warrants a complete eye exam. Eye doctors and medical researchers continue to seek better ways to treat and control glaucoma. Their efforts in recent years have led to earlier detection of the disease, new drugs, laser surgery, and more successful surgical techniques.While chronic glaucoma cannot be cured, it can be controlled chiefly through the use of daily eye drops which either increase fluid removal from the eye or decrease the amount of fluid produced within the eye. Laser surgery is an additional option if the eye medications fail to hold the pressure in check. In more severe cases, surgery may be required to improve the drainage of eye fluids. Anyone who has glaucoma, who is suspicious of glaucoma, or who has a family history of glaucoma should have one or all of these tests performed for a baseline. Insurance companies usually cover this new technology. However, the test itself is not very expensive. If you fall in any of the above categories, please call the office and schedule a complete eye examination. This preventative technique is used to preempt the occurrence of a glaucoma attack. During an eye examination, an eye doctor may notice that the angle in the eye appears to be too narrow. A narrow-angle tends not to drain properly and can lead to a build-up of fluid and pressure, a precursor to glaucoma. In LPI, a laser is used to place a tiny opening in the iris in order to improve drainage. 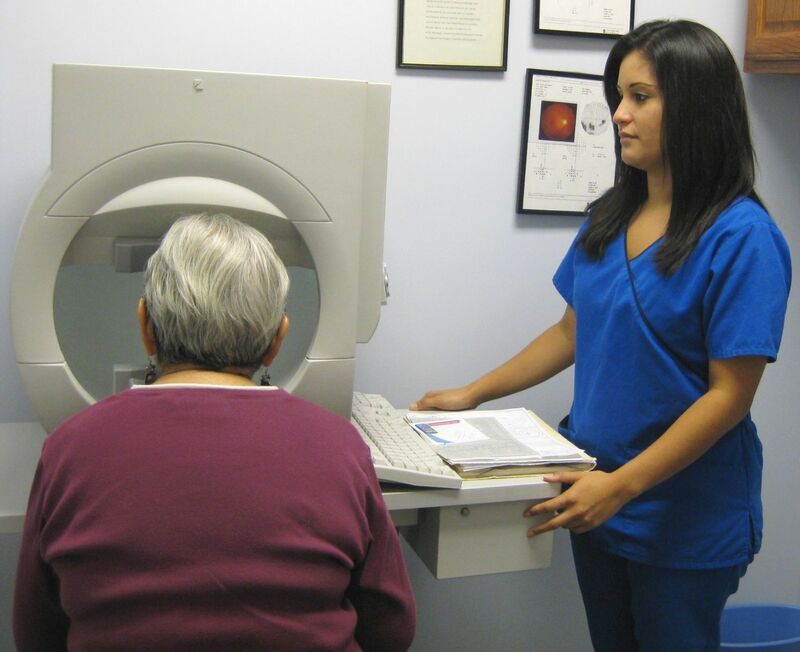 The treatment requires no sutures and is handled on the same day, outpatient basis. 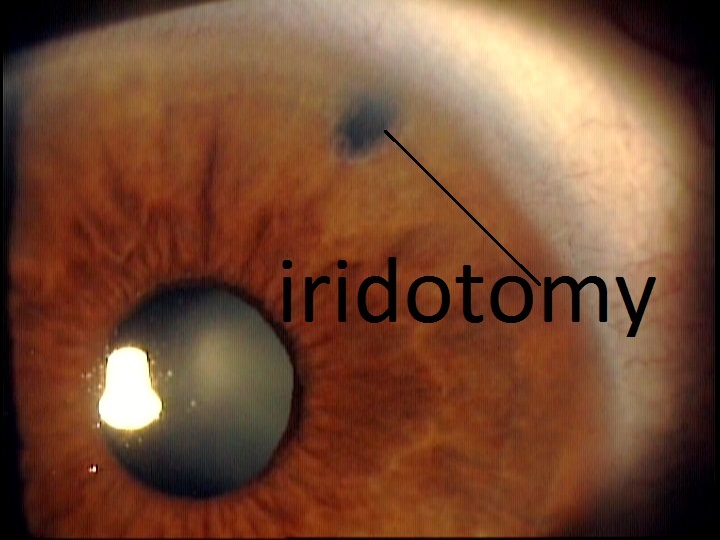 The patient is required to use anti-inflammatory eye drops for approximately one week following the treatment. LPI has a very high success rate. SLT is used for patients who have already been diagnosed with glaucoma and for whom eye pressure remains too high even after trying treatments with various eye drops. During the treatment, a laser is applied and thus stretching the pores and opening up the outflow channels for fluid, which decreases eye pressure. SLT is the same day, outpatient procedure that causes minimal discomfort. A topical anesthetic is administered in the eye prior to the treatment. Then a clear lens is placed on the eye to help focus light. The patient experiences approximately 30 to 40 flashes of light while the laser is applied. The treatment takes about ten minutes per eye and patients usually go home after another hour. Anti-inflammatory eye drops are administered for approximately one week following the treatment. Any reduction in IOP is seen within the first four weeks following the procedure. The success rate for ALT is approximately 75%. When all other treatments fail, glaucoma surgery (filtration) may be called for. The purpose of the surgery is to create a new outflow channel that works in tandem with the existing channels. The resulting increased drainage reduces the pressure in the eye and prevents any further eye deterioration. It is important to understand that glaucoma surgery cannot improve or reverse the damage already done by the disease. Its use is a preventative measure to limit further damage or worsening of the disease. The surgery has about an 80% success rate. Glaucoma surgery is handled on an outpatient basis; no overnight hospital stay is needed. The procedure takes less than one hour. A local anesthetic is administered. The surgery does require some sutures, which may need to be removed during recovery. Patients use antibiotic and anti-inflammatory eye drops for several weeks following the procedure. 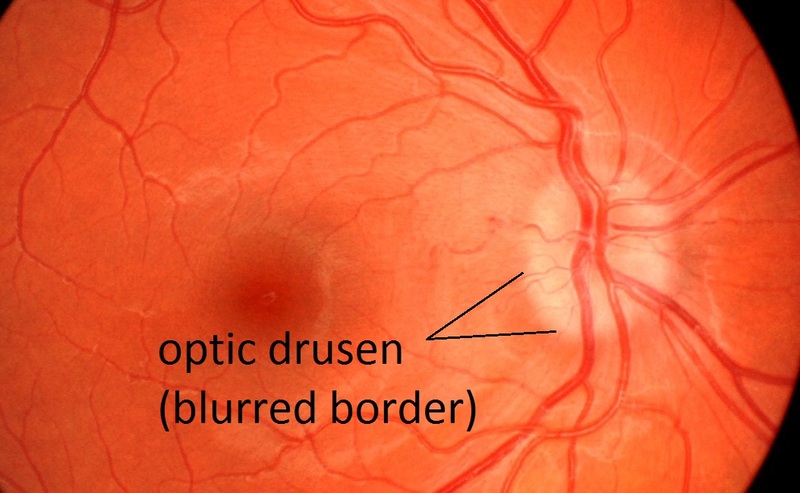 Blurry vision may occur after the surgery but is typically temporary. Often times the first symptoms of Multiple Sclerosis are eye related. Patients will experience blurred vision or loss of color vision. 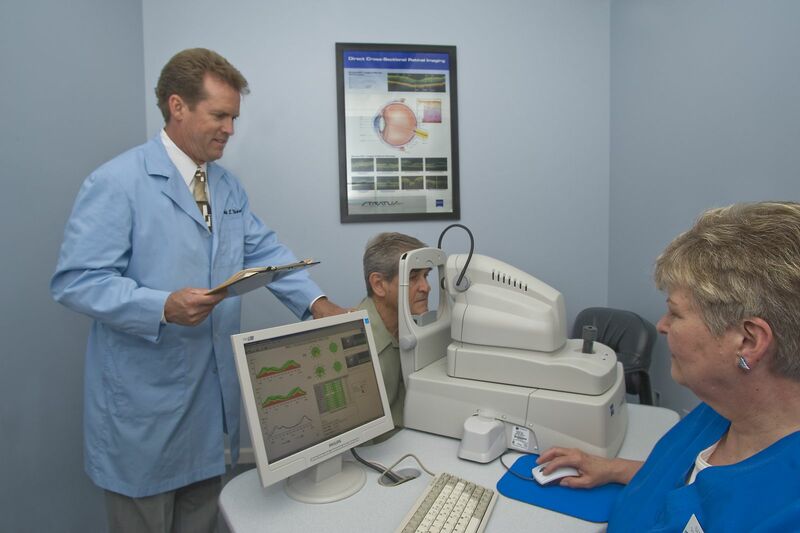 Many times it is the visual field testing that alerts the eye doctor. Although we can not diagnose Multiple Sclerosis, we can get a pretty good idea through an eye exam and refer to the appropriate health care provider for further diagnostic testing. Right:Harmless condition caused by calcium deposits. Both Photos can give a similar appearance. Additional testing is needed to differentiate between the two.